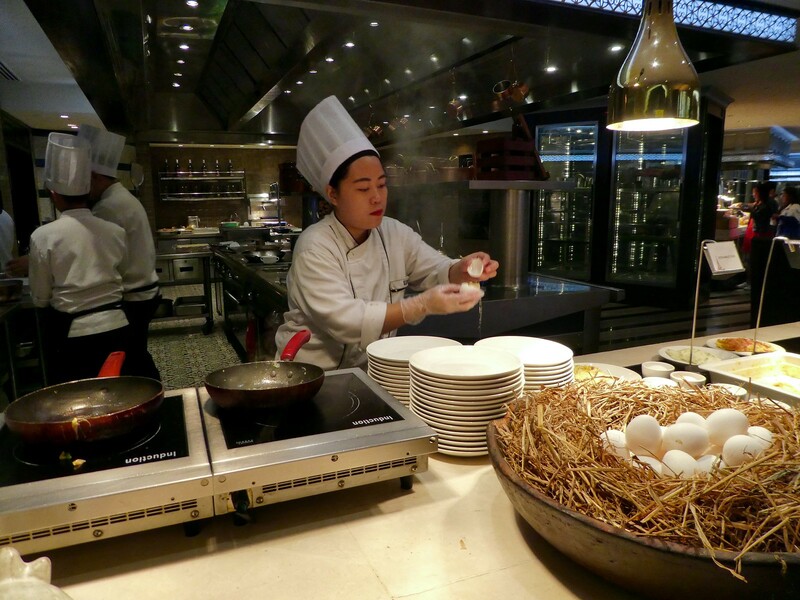 Breakfast at the Manila Sofitel is absolutely delicious, the only difficulty being deciding what to select from the vast array of dishes on offer. We were shown to a table overlooking the indoor stream and settled down to a long, leisurely breakfast, eating too much as usual! After the previous evening’s fruitless attempt at hiring a Grab taxi , we secured one immediately and were soon heading to the University of Santo Tomas at a cost of only 125 Peso (£1.75). The journey was surprisingly quick with no traffic disruption and in 20 minutes we were leaving the taxi on busy Espana Boulevard and exploring the tranquil setting of the 400 year old campus with its charming old buildings and attractive grounds. 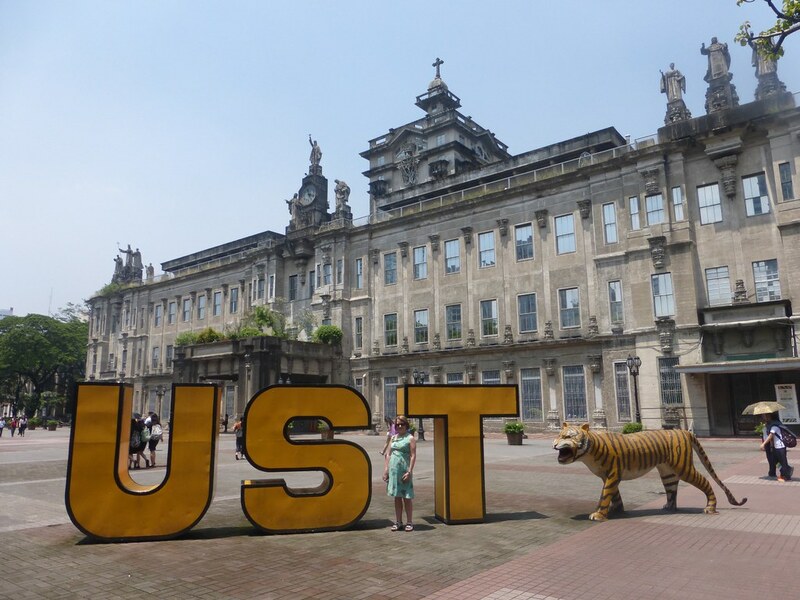 The University of Santo Tomas (UST) holds the distinction of being the oldest Asian university. It was founded in 1611 and is a private Roman Catholic research university and the only one to have been visited by three Popes four times. 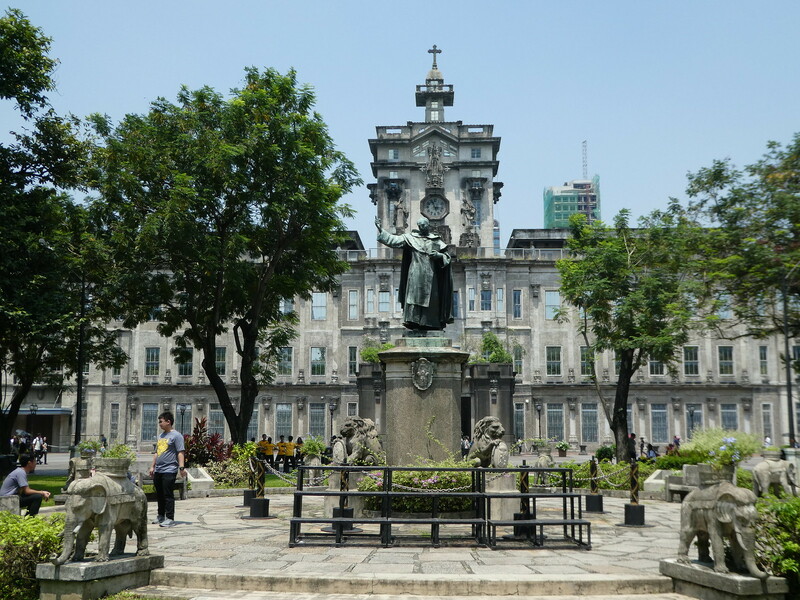 UST was declared a national historic landmark in 2011 with several of its structures declared as national treasures. The first of these is the historic Arch of Cultures which stands proudly at the main entrance gates. 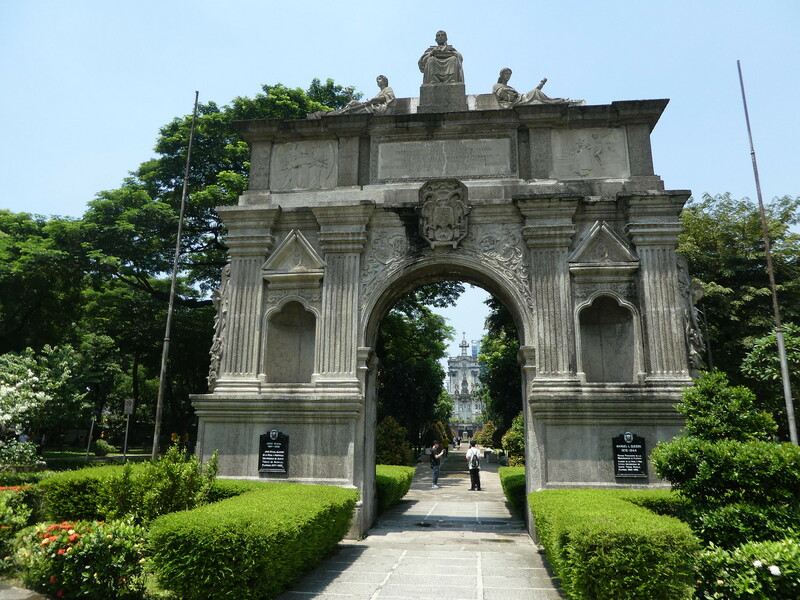 This landmark is one of the remaining relics from the original Intramuros campus which was badly damaged during the Second World War. The arch was transferred and reconstructed in its current position in 1955. We strolled through the manicured gardens towards Plaza Mayor, a square dominated by the majestic main building of the university which was constructed in 1927. As it was a Saturday morning we were surprised to note that classes were taking place with students wearing different uniforms depending on their faculty. Within the grounds are the Pharmacy and Medicinal Botanical Gardens which are both free of charge to visit. Here we found large numbers of plants and herbs all of which have healing and medicinal qualities. It was an absolute delight to follow the narrow stone pathways through these gardens and to hear so many birds chirping in the trees. The university’s museum is closed at weekends so hopefully we can return there on a future visit to Manila as it would be interesting to view. Behind the main building we came to the more modern Quadricentennial Square. This open space featured an interactive dancing fountain with a sculptural centrepiece called Tetra Global. Surrounding the square were picnic tables and benches and it appeared to be a popular meeting point for students. Leaving the university, we noticed a cosy little cafe where we ordered large cappuccinos which, although delicious, were the size of soup bowls and it took us ages to finish them. Just before leaving, we used the cafe’s wi-fi to order yet another Grab taxi, this time our destination was Chinatown. The journey only cost 125 Peso (£1.75) and was estimated to take 20 minutes but Saturday lunchtime traffic in Manila was totally gridlocked and our short journey actually took one and a half hours. I’d read that Manila is infamously noted as being one of the worst cities for traffic but never expected it to be so bad, I’m certain that we could have walked there faster! Checking our phone map, we decided to leave the taxi a couple of blocks early and walk the remainder of the way otherwise we might have wasted the entire afternoon sitting in the cab. Chinatown is centred upon Plaza San Lorenzo Ruiz which was known as Binondo Square until 1982. 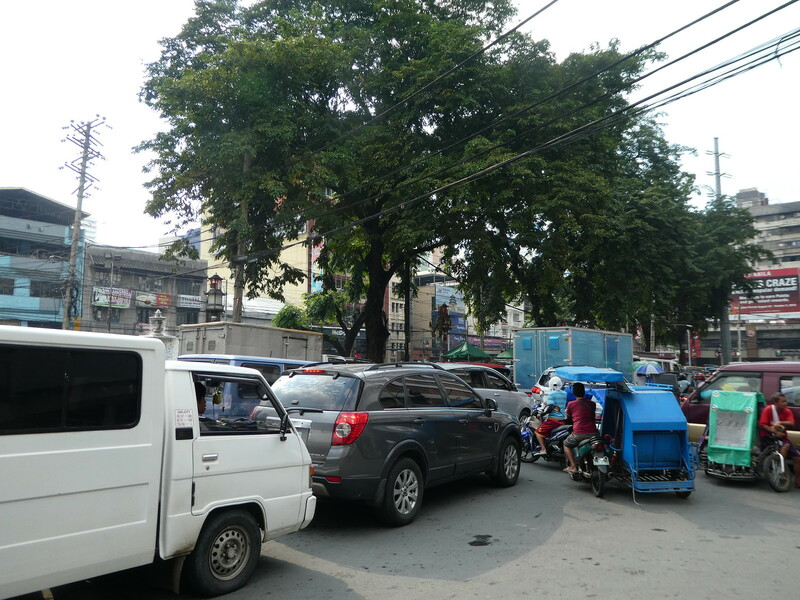 The square was absolute mayhem with cars, vans, jeepneys and tricycles jostling for position coupled with market traders and street food stalls spilling onto the road adding to the chaos. 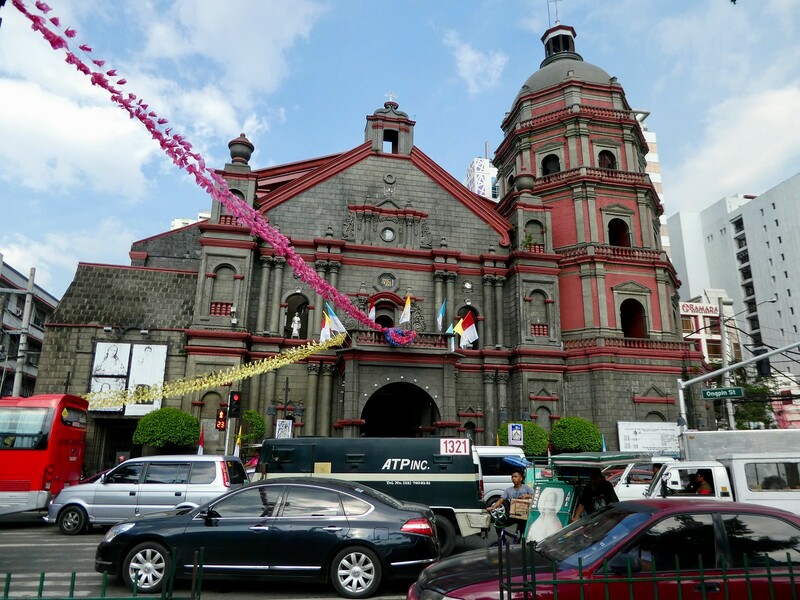 Our first stop was to take a look inside the ancient Catholic Binondo Church which dominates the square and was built in Spanish Baroque style in 1596. It is notable for its octagonal 5 tier Chinese style bell tower reflecting the culture of the surrounding Chinatown. Inside the church was an oasis of calm compared to life outdoors. We then edged our way along the narrow streets towards the Chinese Gate. Wandering along, we didn’t come across much of interest aside from hundreds of small shops and restaurants, the smell of cooking creating a heady mix with traffic fumes in the hot, sultry weather. Traffic was gridlocked trying to pass through the arch with little attention being paid to the use of lanes. 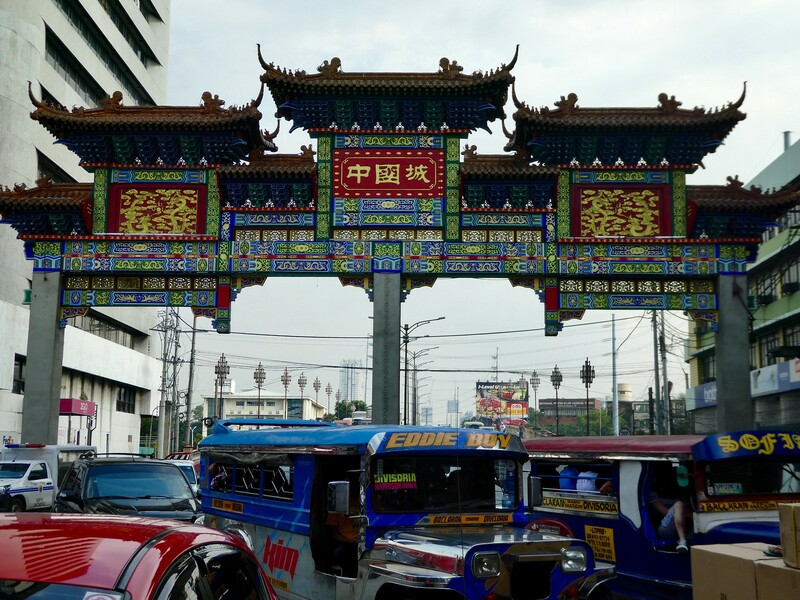 The Chinese Gate is located near the foot of the Jones Bridge in Binondo and is only three years old. It was a gift from the city of Guangzhou in China to celebrate 40 years of diplomatic ties between the Philippines and China. The wide arch features three pagodas and is thought to be the largest Chinese arch in the world overtaking that of Washington DC by 3.8 ft. The arch is 63.8 ft (1.62 m) high and 74 ft (1.88 m) wide. Continuing over the bridge and across the River Pasig we admired the vast General Post Office building and were able to take a quick look inside just as it was closing. 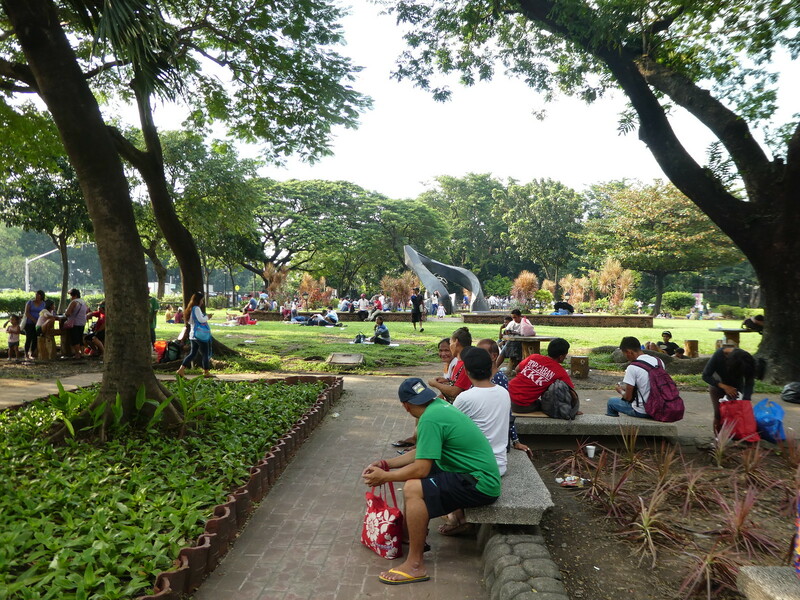 Our afternoon walk continued past City Hall and into the vast Rizal Park which we had tried to visit the previous day when we had found it to be closed for security reasons. I’m pleased we made the effort to return as there was much to see within the park including several large museums which we didn’t have time to visit. The park is a favourite leisure spot with families enjoying the wide open spaces and ornamental gardens. 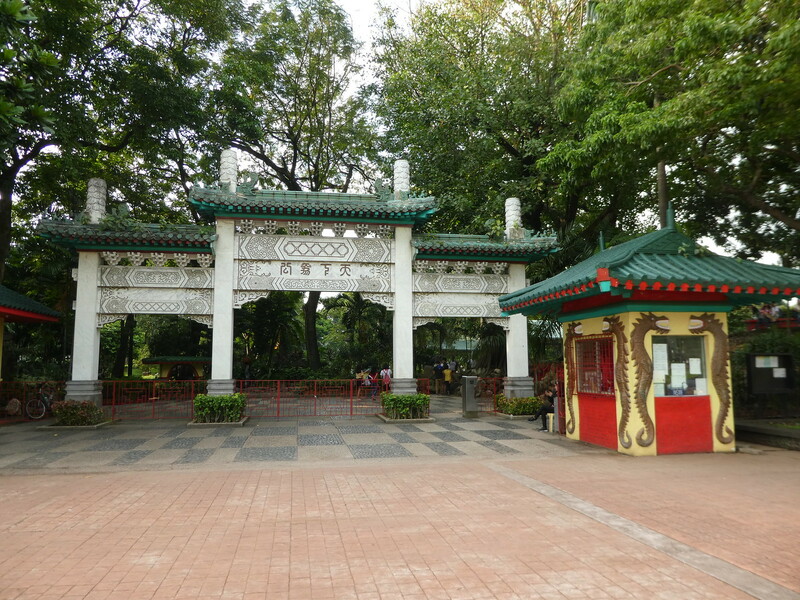 Of particular interest to us were the Japanese and Chinese Gardens, both of which were free to enter. To enter the Japanese Garden one needs to complete a short form but this only took a couple of minutes. 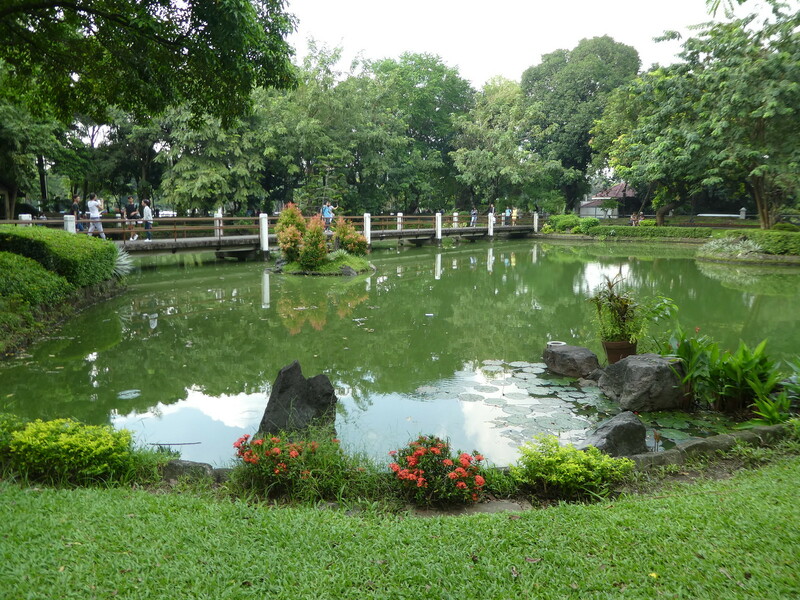 This garden was built to promote friendship between Japan and the Philippines. It features a lagoon with small bridges, stepping stones and a traditional red Japanese gate known as a ‘Tori’. The garden was landscaped with Japanese maples, bamboo, azaleas and camellias and sitting on one of its benches it felt very peaceful in the fading sunlight. Next, we wandered along to the nearby Chinese garden which had an ornate entrance gate carved with swirling dragons. This garden was of a similar size and was equally beautiful with its mirror pools and brightly painted pagodas. Reaching the far end of the park we could hear military music so we hurried along to catch the final few minutes of the Changing of the Guard which takes place at 4.00 p.m. each day and lasts approximately 45 minutes. Before leaving the park we tried to use the free wi-fi to call a taxi but despite having a strong signal we were unable to load any pages. As we’d already walked a considerable distance and it was hot and humid we didn’t particularly want to walk all the way back to the hotel so we crossed the busy main road. The only positive feature of Manila’s grid locked traffic being that it was easy to get across safely! Lots of regular taxis were passing by but it took ten minutes to succeed in obtaining one, but we then sped back to the hotel reasonably quickly by Manila standards. It was already 5.00 p.m. so there was sadly insufficient time to relax by the pool as we had made a dinner reservation in Intramuros for 7.00 p.m. A refreshing pot of tea followed by a shower brought us back to life and ready to enjoy an evening of traditional Filipino fine dining. Having spent so much of our time in Manila stuck in traffic, we decided to allow an hour to get to the restaurant as it was a Saturday night. Fortunately, we managed to hire a taxi straightaway and even arrived at the Ilustrado Restaurant ten minutes early! The restaurant is located in the historic walled city of Intramuros and is centred around an attractive Spanish inspired courtyard garden. We were warmly welcomed and shown to a window table in the restaurant which combines old world charm with modern styling. In one corner a trio were serenading guests and with the soft lighting this created a soothing ambience. We were served by a team of three very knowledgeable and friendly waiters whose names were Jerry, Jason and Joseph. 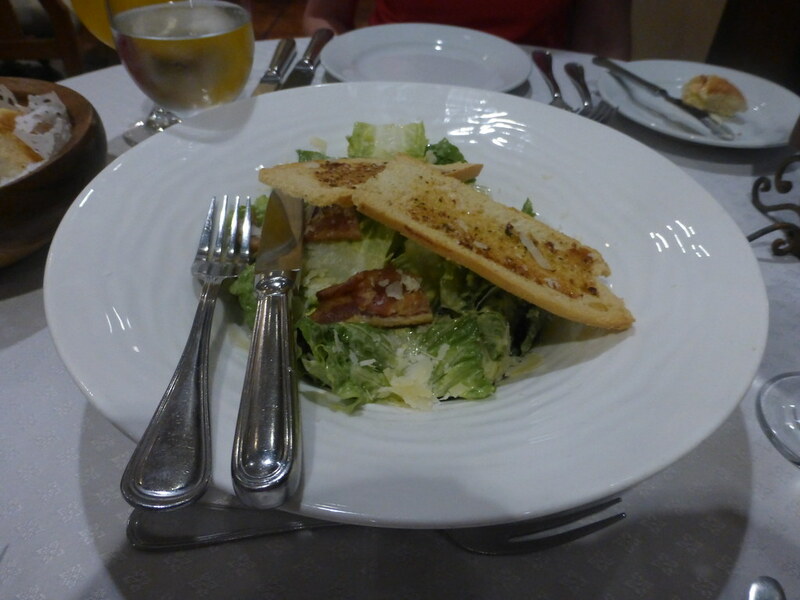 We started our meal by sharing a large bowl of Caesar salad and then chose two signature dishes from the main course menu. The first one was Paella Ilustrado which looked amazing filled with fresh prawns, clams, mussels, chicken and chorizo and tasted delicious. Rather than use saffron to add colour and flavour to the paella, Ilustrado use annatto from the seeds of the achiote tree giving the dish a slightly nutty, sweet and peppery flavour. Our other main course selection was Adobong Bagnet enriched with crab fat, the Ilustrado version of the Philippine national dish. The pork was tender and melted in the mouth, its rich sauce tasting sublime. To complete our meal we ordered Sampaguita ice cream which the restaurant created themselves and is made from the Philippine national flower. It had a delicate, fragrant aroma and I savoured every spoonful. Our other dessert, a slice of ultimate cheesecake was light and creamy and one of the best we’ve tasted. 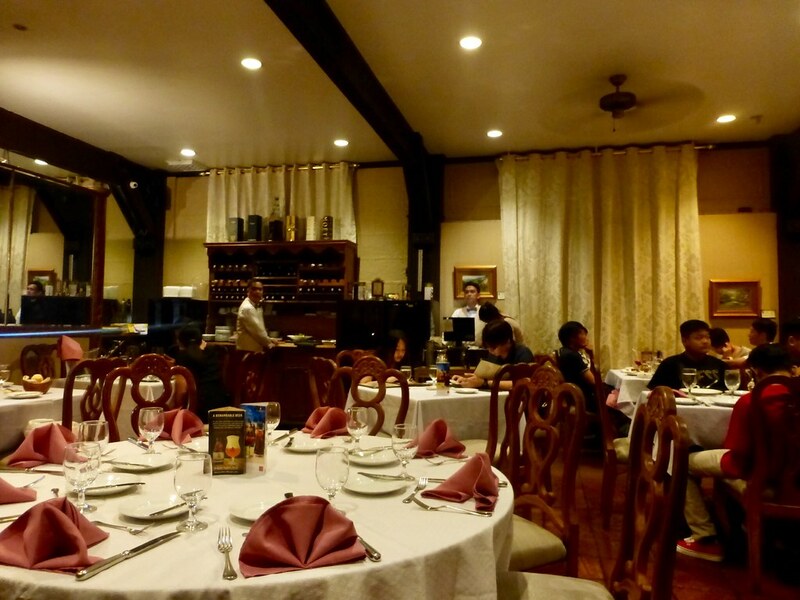 Our fine dining evening at Ilustrado was splendid with high quality cuisine and warm hospitality and I would recommend eating there whilst visiting Manila as it is inexpensive by European standards. 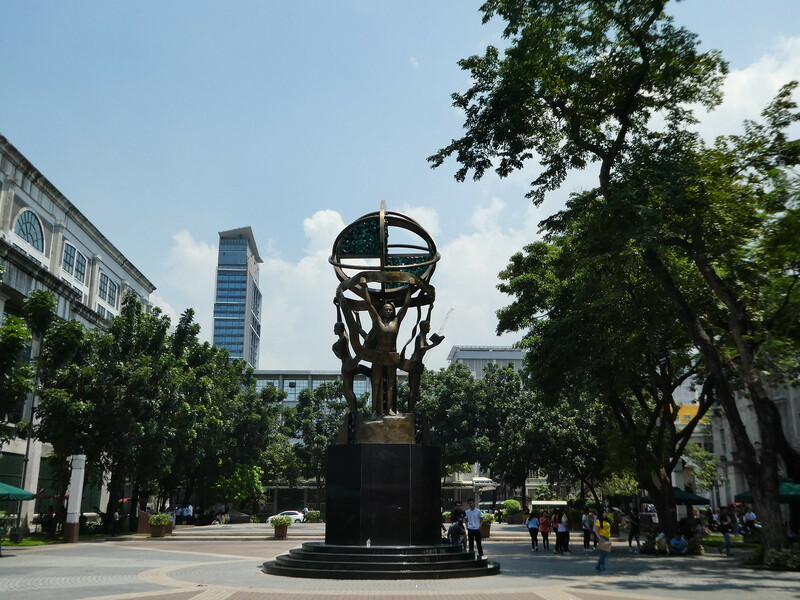 Manila is very interesting, somewhere else to add to your destination list. Thanks for your welcome thoughts. Thank you for your kind words Gwendolyn it’s so nice to read your inspiring comments. 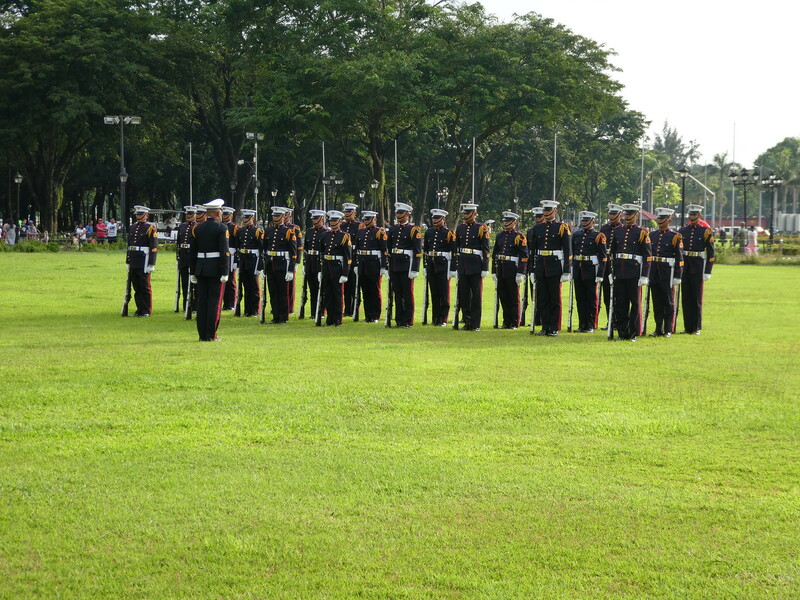 We had a lovely visit to Manila and hope to return to the Philippines again to see more of the country. 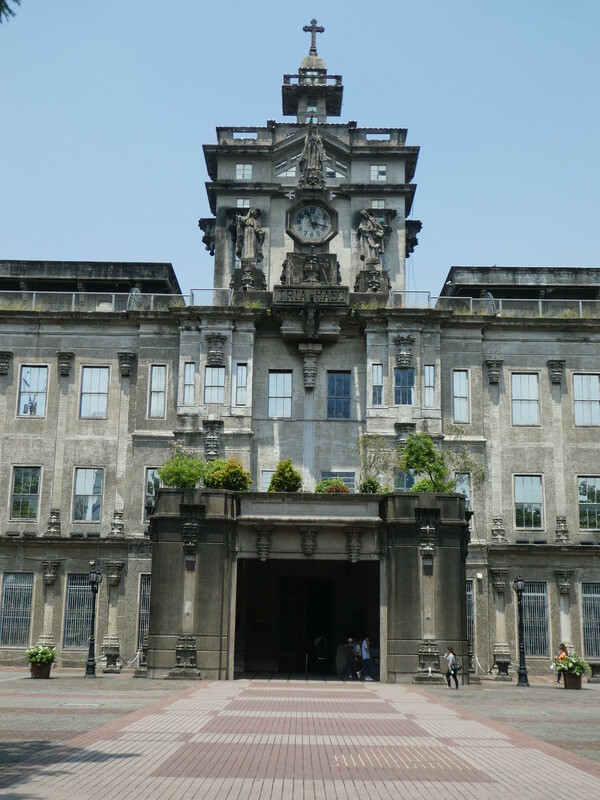 The University of Santo Tomas is really beautiful. What a treat this photo tour is! Thank you so much for taking an interest in this post Marsi. The university campus is beautiful. So pleased you enjoyed my tour of Manila Rebecca. We had a marvelous time. Thanks for all the wonderful photos and information! It’s my pleasure, so pleased you like them! I love everything about the Philippines, the architecture, people and food. Hope to visit some of the smaller islands on a future visit! Glad you made it to dinner on time this time. Is the traffic always that bad there or just a particularly busy time to be visiting the city? I think the traffic is always bad in Manila due to a lack of public transport necessitating almost everyone to travel by car. The city was absolutely gridlocked on the Friday evening and Saturday afternoon but was not so bad the remaining time we were there. Filipino food is absolutely delicious and very reasonably priced. Hope you get to visit sometime! 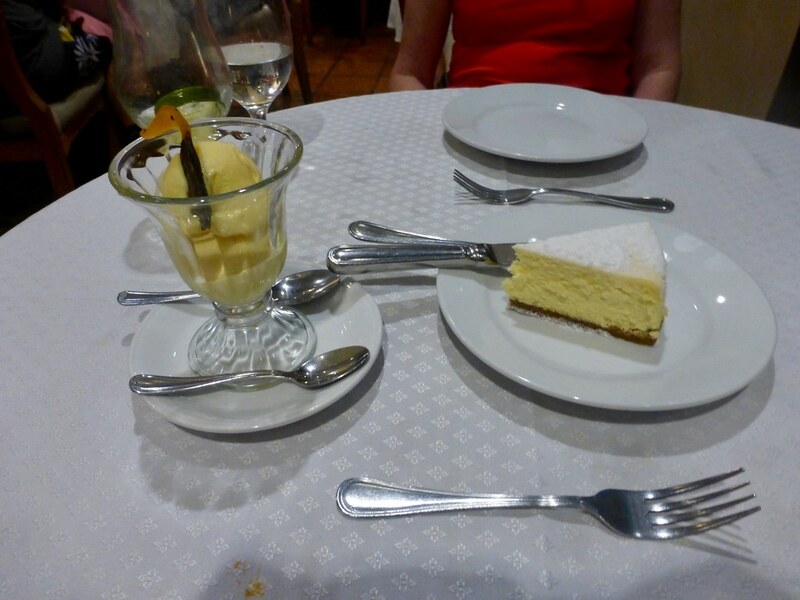 It was delicious, as were all the dishes served at the Ilustrado restaurant in Manila. Thank you for commenting. Why not visit San Sebastian Church? 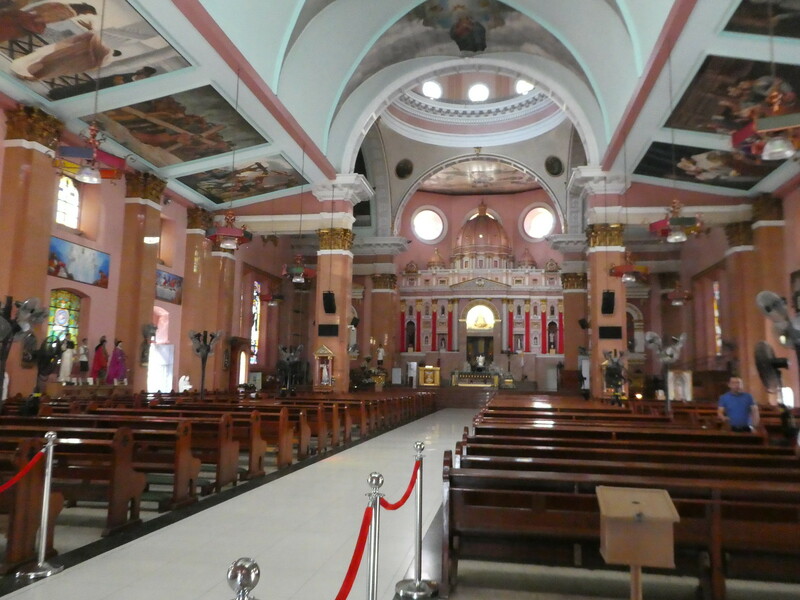 It’s one of the most beautiful churches in Manila. Thank you for your suggestion. I will look into visiting that church on a future visit to Manila. Thanks Ian for your kind words. 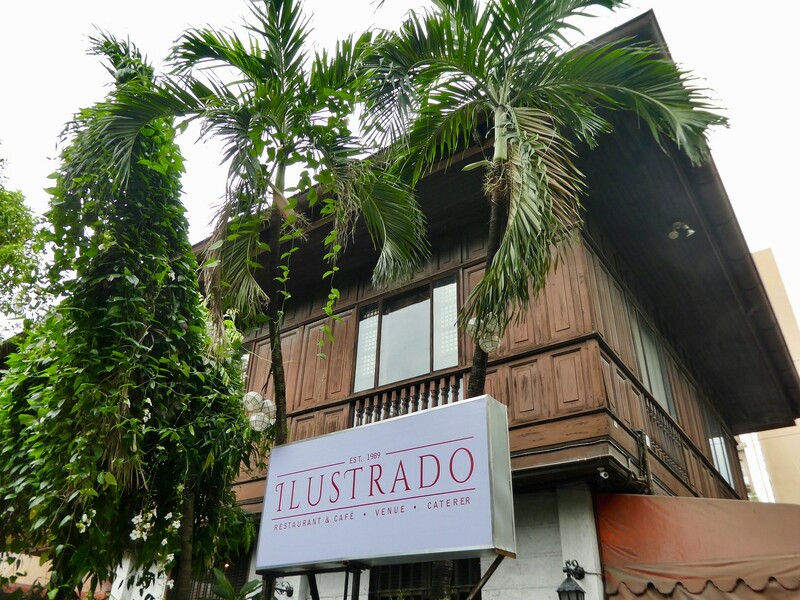 The food served at Ilustrado was first rate. Thank you for your continued interest in my Manila posts. It was such an interesting city to visit and one I would return to. I had no idea that Manila had so much to offer, don’t really know anything about it. The architecture and gardens all look fabulous but the traffic sounds like a nightmare. I think you did the right thing in walking as much as possible. Great photos. what an interesting place to travel, the food looks delicious! 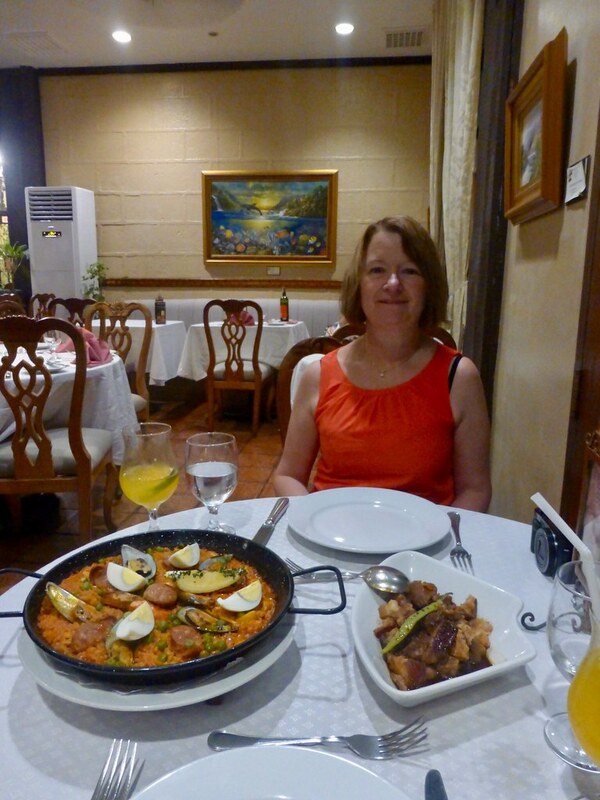 Manila was very interesting and our dinner at the Ilustrado restaurant delicious. You have visited so many countries, do you know how many? Travelling in an armchair at home, by reading your blog, is almost like real, thank you. Thank you so much for your kind words, it’s so lovely to read that you enjoy hearing about my travels. I’m not sure how many countries I’ve visited but feel so fortunate to be able to see so much of the world whilst I can. I really enjoyed reading your posts about my country. It’s great to see your perspectives and the way you perceived our culture.Totally different from your eyes. 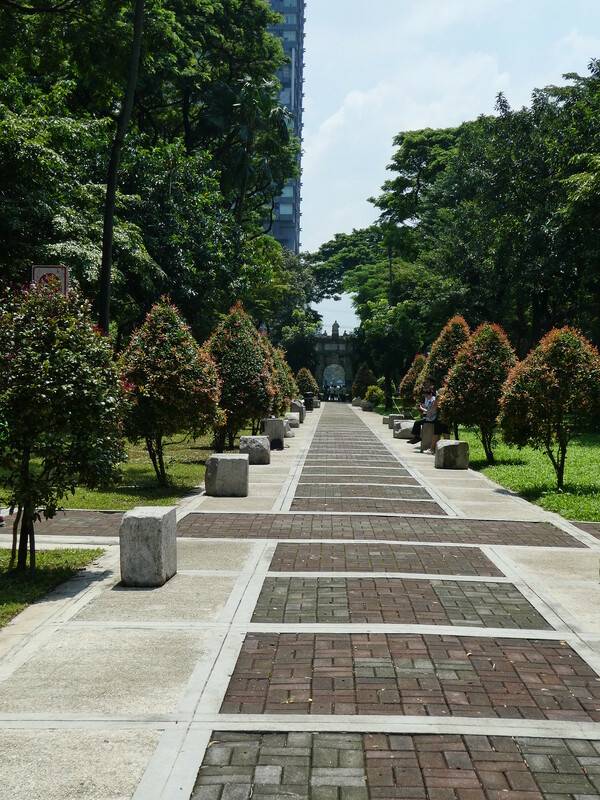 Oh how I miss those tropical vibes and the Botanical garden in UST is just awesome. So happy that you enjoyed strolling over the Manila area,despite the traffic, its a wonderful experience even for a local like me, do you have any plans to visit the beaches and down southern islands. It would be great if you see also the virgin beach resorts! I miss my homeland, right now freezing in German Winter! Have a fabulous time I would be looking forward to follow your adventure! Thank you so much for taking an interest in my posts on Manila. We hope to return sometime in the future to visit the beautiful beaches on some of the southern islands, that would be so nice! 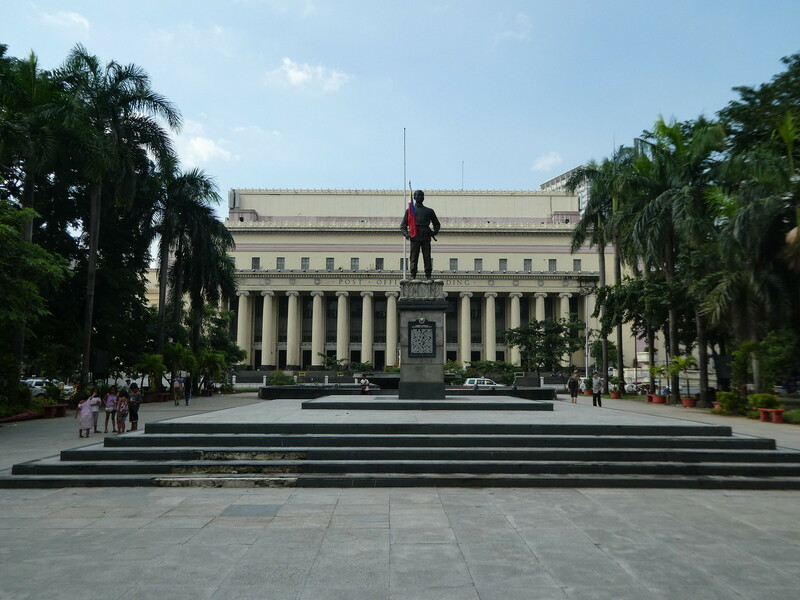 You’ve written quite a lovely post about your trip to Manila. As a local, I haven’t even been to half the spots you’ve mentioned so two thumbs up for you for being the wanderlust that you are. How long will you be in the country? Enjoy the rest of your stay. Thank you for your kind words. We have actually now left Manila and are back home but I would definitely like to return sometime in the future and explore more of the country and visit some of the beautiful beaches. Thank you for your welcome thoughts Jo on my stay in Manila. 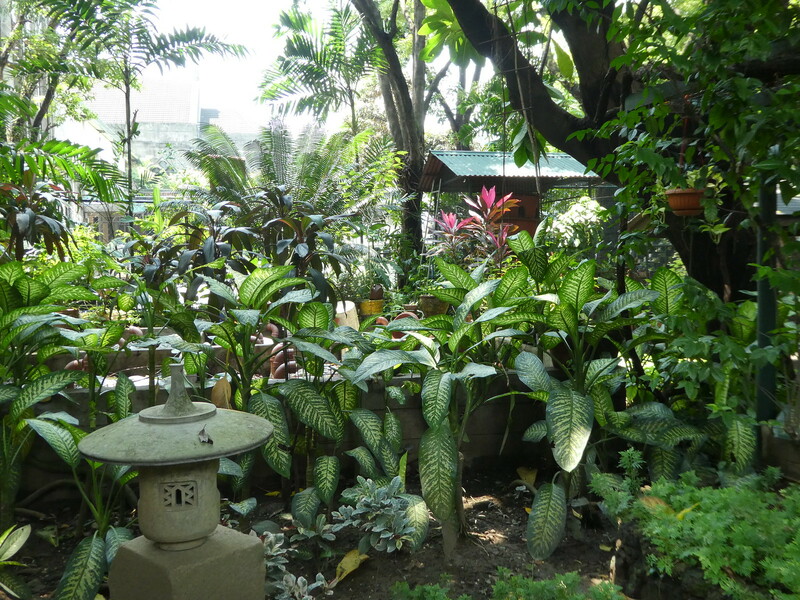 I love exploring different parts of Asia and found Manila very interesting and the gardens were indeed gorgeous. Manila has never really occurred to me as a holiday destination, but it looks fascinating. Even if the taxi issues remind me very strongly of our later trips to Macau, where the local taxi drivers have become notorious for not wanting to stop for anyone who doesn’t look like a high roller bound for one of the casinos. 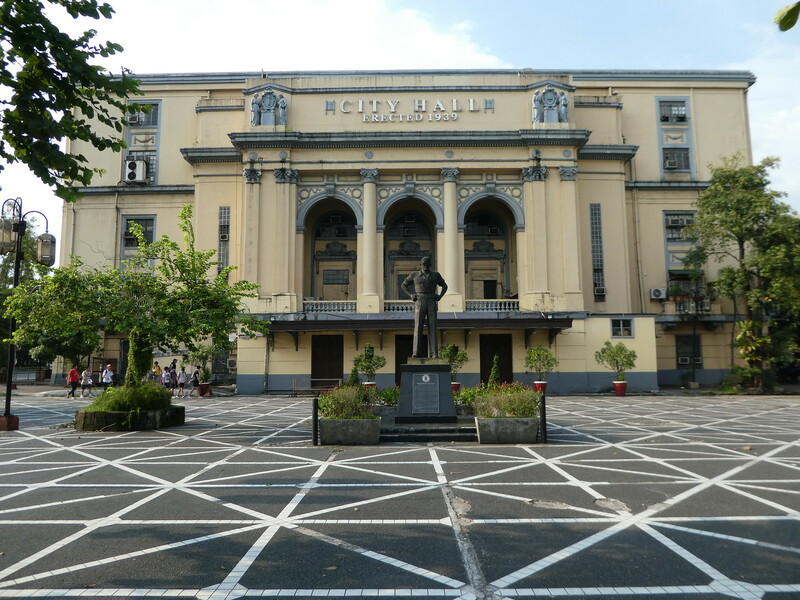 Thanks Stella for taking an interest in this post on Manila. We found Manila fascinating for a few days and on a future visit to the Philippines would like to explore some of the smaller islands. 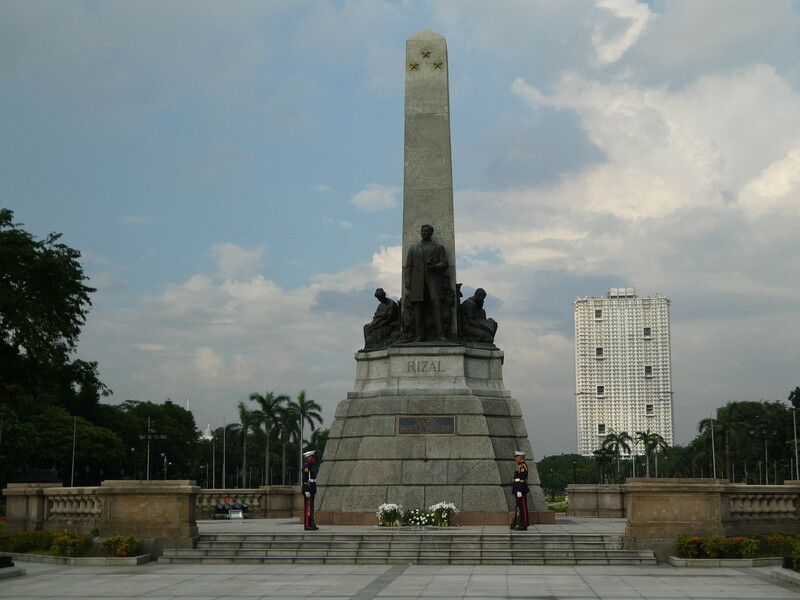 Thank you for your kind words about my day of sightseeing in Manila and for your suggestion to visit the National Museum.